Japanese Crepe is popular sweets in Japan. 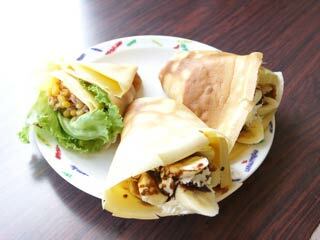 It is rapped pan-cake with many kinds of ingredients, such as chocolate, cream, fruits and other sweet flavors. Crepe is mostly sold outside, especially hip spot like Harajuku. First mix eggs. Don't forget to remove this white piece. Use another bowl and add flour 100g. Add salt 1/4 small table spoon. Add baking powder 1/4 small table spoon. Then add mixed eggs and other little by little and mix them well. Add milk little by little, and mix them. After you add all milks, then add one drop of Vanilla. Then, lap the bowl, and put it in refrigerator for 30 min. Let's bake a crust of crepe. Heat a pan with medium fire. Pour one scoop of crepe-crust. Flip it and bake both side. Remove it and cool it down for a white. Let's make Chocolate Banana Crepe. Next, let's make Tuna Crepe. That's it for Tuna Crepe. If you have anti-over-burning pan, crepe is so easy to cook. You can add your own favorite ingredients in Crepe.